Wrapped in a decadently plush charcoal upholstery, this oversized ottoman makes the most of its generous scale. Underneath the removable cushioned top: a handy, dandy storage compartment that’s perfect for last-minute cleanups. 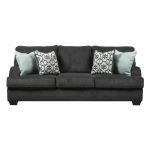 Wrapped in a decadently plush charcoal fabric, this sumptuous sofa and loveseat set—with roll back arms for distinctive flair—is so easy to fall for. Adding to the feel-good experience: eight toss pillows that bring tone, texture and comfort to the scene. 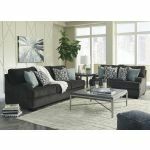 Pair this set with the oversized chair and ottoman to complete the look. Wrapped in a decadently plush charcoal fabric, this oversized chair—with roll back arms for distinctive flair—is generous in scale and sumptuous in feel. A cozy place for two and an indulgent spot for you, it’s beautiful proof that bigger is better.